Columbia 10930. 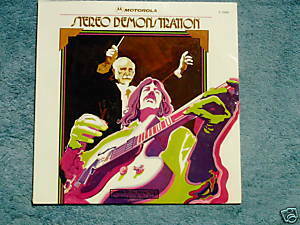 Motorola's Stereo Demonstration 1972 LP includes Santana's "Black Magic Woman", Peter Nero's "We've Only Just Begun", Chase's "Open Up Wide", Blood Sweat Tears' "Smiling Phases", Dean Jones' "Side by Side", Barbara Striesand's "Roller Skate Rag", Ruby Keeler's "I Want to Be Happy", Helen Gallagher's "Too Many Rings Around Rosie". Sealed LP, cover and shrink wrap are in excellent condition.